The best historical fiction, in my opinion, can only take place at the time in which it is set, and in which the setting is as integral to the plot as character and story. 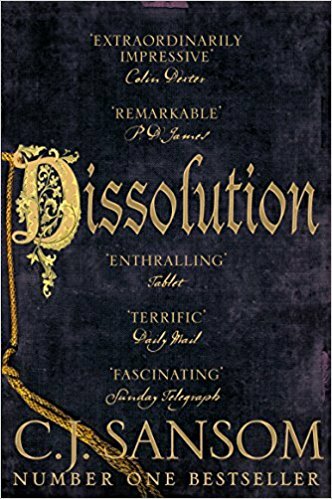 One book that certainly meets this standard is CJ Sansom’s first novel, Dissolution, which I read when it came out in 2003. Set in a monastery in Tudor England, the hero Matthew Shardlake, a hunchback lawyer, is sent to investigate a murder at the time of the dissolution of the monasteries. It is a masterclass in how to weave a locked room murder mystery in a confined, often claustrophobic setting, with much bigger political themes: Thomas Cromwell’s religious reform agenda, the corruption (and charity) of the church, and the execution of Anne Boleyn. CJ Sansom’s books sell in the hundreds of thousands, and I’m convinced a big part of that is his main character. Shardlake is an immensely sympathetic figure: his struggles with his disability, his loneliness, and his religious beliefs make for compelling reading. Shardlake doesn’t only interrogate suspects, he questions his own beliefs and those of the society he lives in. Yet as a character he is well-rounded, and his flaws are as interesting as his virtues. He can be prickly, judgemental, jealous and insecure, although a large part of this is down to the discrimination he faces as a hunchback. We really see how he has been shaped and continues to be shaped by his disability. His moral quests in the face of Tudor society’s brutality and indifference give us someone to root for – he is a man of his time, but whose beliefs we share. CJ Sansom is such a good writer, but also so accessible. His prose is simple, but elegant. His research must be exhausting, but it is so lightly worn. You live his Tudor England, it is so immersive. But plot is where Sansom truly excels. This book taught me so many of the basic lessons of crime writing: a narrow pool of suspects (nearly all monks, all different, all nursing secrets); weaving of plot and character; balancing interrogation, discovery and action; incorporating twists; and the importance of having the antagonist fight back. I was so delighted and honoured that CJ Sansom read my book, Blood and Sugar, and enjoyed it. I am currently reading his seventh Shardlake novel, Tombland, and loving it. I hope very much that there will be more to come.